Well, I'm slamming through the other installments in my Fairy Tale series. This time, it's Snow Noir. 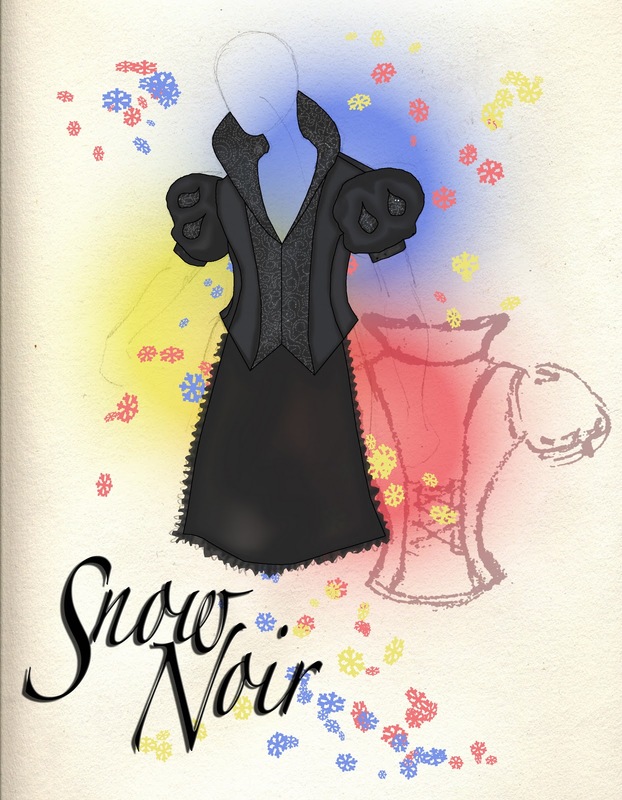 Yeah, I'm calling her that because it's a riff on Snow White but all in black. 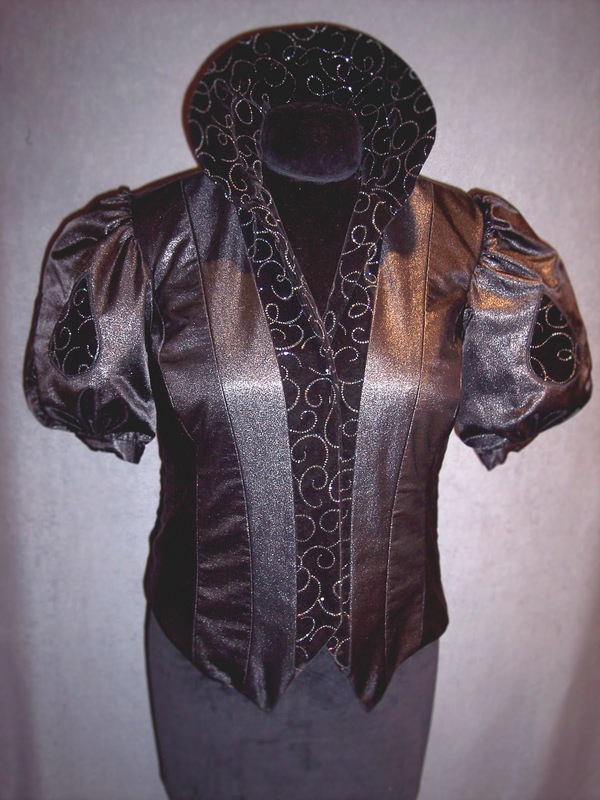 This particular vest has a lot of pre-conceived ideas surrounding it... The Disney version of the fairy tale, Snow White and the Seven Dwarves, is so staunchly set in our cultural collective consciousness that it's hard to envision Snow White without seeing the character from that particular movie. Snow White wears a yellow dress with a blue bodice on the top. But I couldn't do that, because I set up the parameters of this particular expression using vests. Snow White, according to Disney, doesn't wear a vest. Hm. So what was I going to do? 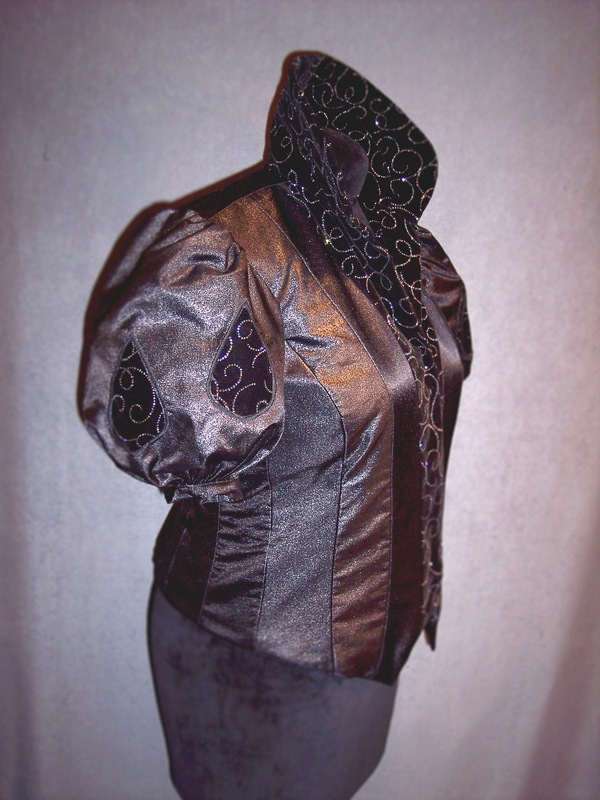 I added sleeves to my vest to make it look more like a bodice. One of the other parameters I've set for myself is that all the vests for the fairy tale icons I'm using have to say something about the characters or tales themselves. 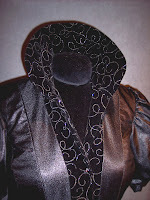 I didn't want to simply recreate "costumes" and replicate what the ladies would wear in each story. I wanted to make a comment on how we perceive them, their role, or their function (or ultimately their non-role or non-function). I wanted to draw attention to our own thinking processes as viewers and point out the disjunction between what our expectations are and what we actually get. When do these garments stop fitting into what we think of the characters? How far can we push it or expand our understandings? And I think that kind of "framing" works well as a perspective to use when viewing the attire as a garment to wear. We have expectations about the clothing we wear. Where are the imaginary lines when our clothing crosses from fashion to wearable art to costume? What is the difference? Why do we draw these lines? What do we expect from our attire? What boundaries do we put on it that are "appropriate" and when do we cross beyond them? So all these decisions added up to stretching the idea of Snow White and putting her into an all black outfit that emulated the Disney version but didn't replicate it. 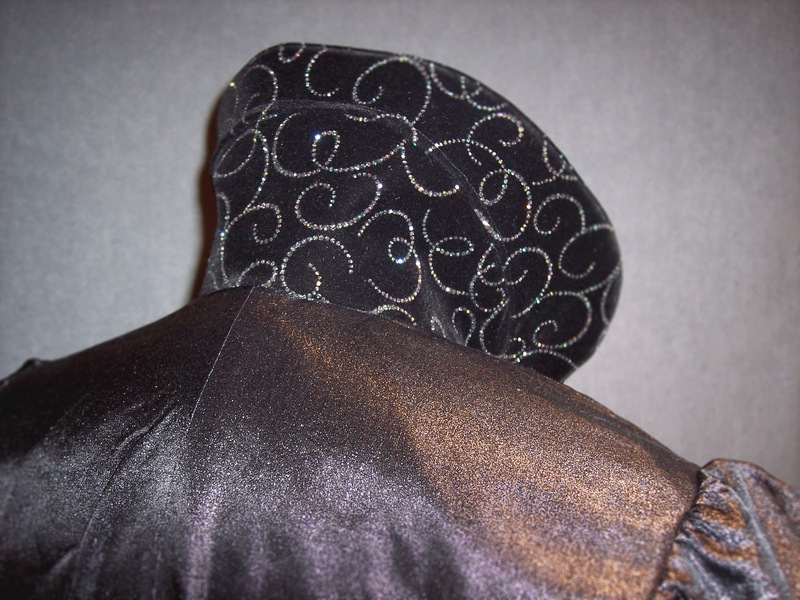 And thus, sparkle velour and oil-slick satin! Hm. This Snow White doesn't mess around... I think she's a bit more mature, and perhaps "wields" her femininity a bit more overtly. It almost looks like SM Snow White... What does THAT say about our Fairy Tale icon?? Is she part of the Fairy Tale anymore? Is this years later? How interesting that we allow our imaginations to incorporate these new ideas onto our pre-concieved notions and understandings of the character, even if ever so briefly? Perhaps we may decide this concept doesn't fit. Perhaps we may decide that Snow White will never ever make room to be Snow Noir. But it's a fun exercise, isn't it? And isn't it interesting how we select our own garments to say what we want to say about ourselves in almost the same way? More soon! Live Life with Relish! Hey Cory, I think you really nailed this! So very slinky, so devine ... and so many interesting questions, it does make you think about Fairy Tales in a different way, how would they be as they aged? And of course, we do all project so much by what we choose to wear! So much fun, as always. Keep having fun! And honestly, I"m making it my mission in life to debunk it. LOL! We'll see how that one goes. LOL!